Which is pretty cool, but not a huge improvement on the `pipe` functionality already exposed in Node streams. The primary advantage is the flatness makes our exit handling very obvious. Similarly in readSectors it flattens the entry and exit of the read mode. Those building React/Redux apps probably want to get those observations into their state. This is relatively easily achieved in redux-saga through the eventChannel API. // events on the channel from it. Tricky to work out, but much more easily read than callback hell. So my Nitrokey HSM arrived and it works great, thanks to the Nitrokey peeps for sending me one. Because the OpenSC PKCS #11 module is a little more lightweight than some of the other vendors, which often implement mechanisms that are not actually supported by the hardware (e.g. the Opencryptoki TPM module), I wrote up some documentation on how to use the device, focusing on how to extract the public keys for using outside of PKCS #11, as the Nitrokey doesn’t implement any of the public key functions. This also encouraged me to add a whole bunch more of the import/extraction functions for the diverse key formats, including getting very frustrated at the lack of documentation for little things like how OpenSSL stores EC public keys (the answer is as SubjectPublicKeyInfo from X.509), although I think there might be some operating system specific glitches with encoding some DER structures. I think I need to move from pyasn1 to asn1crypto. The most involved thing I’ve had to learn this year is how to actually use PKCS #11 to talk to crypto hardware. It’s actually not that clear. Most of the examples are buried in random bits of C from vendors like Oracle or IBM; and the spec itself is pretty dense. Especially when it comes to understanding how you actually use it, and what all the bits and pieces do. In honour of our Prime Minister saying he should have NOBUS access into our cryptography, which is why we should all start using hardware encryption modules (did you know you can use your TPM) and thus in order to save the next girl 6 months of poking around on a piece of hardware she doesn’t really *get*, I started a document: Applied PKCS#11. The later sections refer to the API exposed by python-pkcs11, but the first part is generally relevant. Hopefully it makes sense, I’m super keen to get feedback if I’ve made any huge logical leaps etc. I spent a bit of time fleshing out the support matrix for python-pkcs11 and getting things that aren’t SoftHSM into CI for integration testing (there’s still no one-command rollout for BuildBot connected to GitHub, but I got there in the end). The nice folks at Nitrokey are also sending me some devices to widen the compatibility matrix. Also happy to make it work with CloudHSM if someone at Amazon wants to hook me up! I also put together API docs that hopefully help to explain how to actually use the thing and added support for RFC3279 to pyasn1_modules (so you can encode your elliptic curve parameters). Next goal is to open up my Django HSM integrations to add encrypted database fields, encrypted file storage and various other offloads onto the HSM. Also look at supporting certificate objects for all that wonderful stuff. Recently I’ve been working on a project that makes use of Thales HSM devices to encrypt/decrypt data. There’s a number of ways to talk to the HSM, but the most straight-forward from Linux is via PKCS#11. There were a number of attempts to wrap the PKCS#11 spec for Python, based on SWIG, cffi, etc., but they were all (a) low level, (b) not very Pythonic, (c) have terrible error handling, (d) broken, (e) inefficient for large files and (f) very difficult to fix. Anyway, given that nearly all documentation on how to actually use PKCS#11 has to be discerned from C examples and thus I’d developed a pretty good working knowledge of the C API, and I’ve wanted to learn Cython for a while, I decided I’d write a new binding based on a high level wrapper I’d put into my app. It’s designed to be accessible, pick sane defaults for you, use generators where appropriate to reduce work, stream large files, be introspectable in your programming environment and be easy to read and extend. It’s currently a work in progress, but it’s now available on pip. You can get a session on a device, create a symmetric key, find objects, encrypt and decrypt data. The Cryptoki spec is quite large, so I’m focusing on the support that I need first, but it should be pretty straightforward for anyone who wanted to add something else they needed. I like to think I write reasonably clear, self-documenting code. At the moment it’s only tested on SoftHSMv2 and the Thales nCipher Edge, which is what I have access to. If someone at Amazon wanted this to work flawlessly on CloudHSM, send me an account and I’ll do it Then I can look at releasing my Django integrations for fields, storage, signing, etc. Django’s postgres extensions support data types like DateRange which is super useful when you want to query your database against dates, however they have no form field to expose this into HTML. Handily Django 1.11 has made it super easy to write custom widgets with complex HTML. 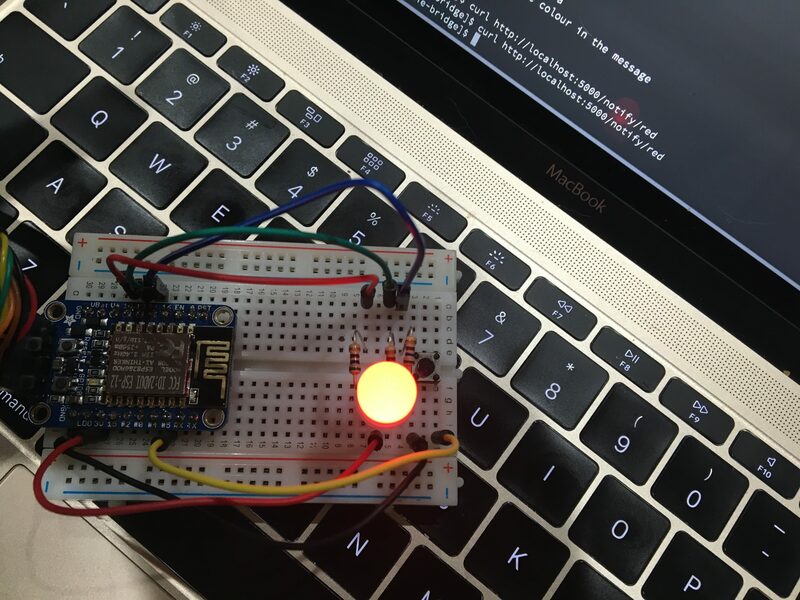 I recently learned about the ESP8266 while at Pycon AU. It’s pretty nifty: it’s tiny, it has wifi, a reasonable amount of RAM (for a microcontroller) oh, and it can run Python. Specifically Micropython. Anyway I purchased a couple from Adafruit (specifically this one) and installed the Micropython UNIX port on my computer (be aware with the cheaper ESP8266 boards, they might not be very reflashable, or so I’ve been told, spend the extra money for one with decent flash). The first thing you learn is that the ports are all surprisingly different in terms of what functionality they support, and the docs don’t make it clear like they do for CPython. I learned the hard way there is a set of docs per port, which maybe is why you the method you’re looking for isn’t there. 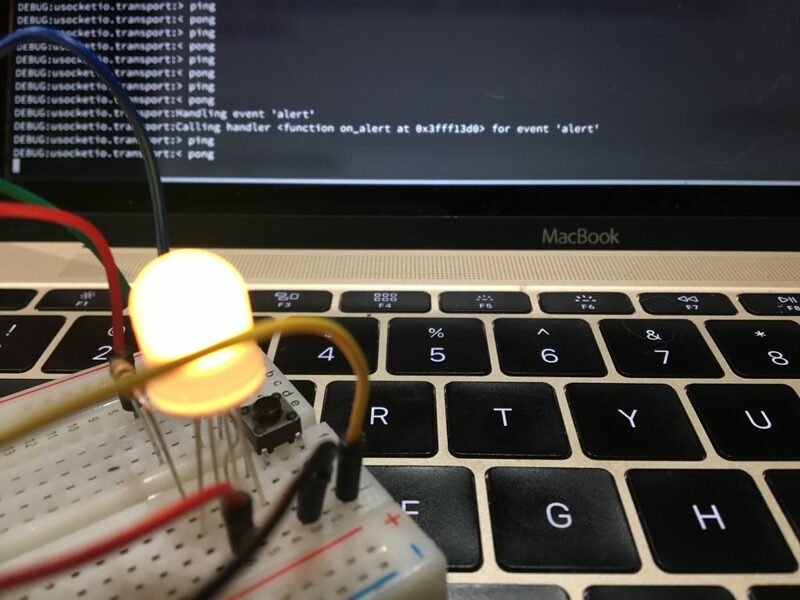 The other thing is that even though you’re getting to write in Python, and it has many Pythonic abstractions, many of those abstractions are based around POSIX and leak heavily on microcontrollers. Still a number of them look implementable without actually reinventing UNIX (probably). The biggest problem at the moment is there’s no “platform independent” way to do asynchronous IO. On the microcontroller you can set top-half interrupt handlers for IO events (no malloc here, yay! ), gate the CPU, and then execute bottom halfs from the main loop. However that’s not going to work on UNIX. Or you can use select, but that’s not available on the ESP8266 (yet). Micropython does support Python 3.5 asyncio coroutines, so hopefully the port of asyncio to the ESP8266 happens soon. I’d be so especially ecstatic if I could do await pin.trigger(Pin.FALLING). There’s a few other things that could really help make it feel like Python. Why isn’t disabling interrupts a context manager/decorator. It’s great that you can try/finally your interrupt code, but the with keyword is so much more Pythonic. Perhaps this is because the code is being written by microprocessor people… which is why they’re so into protocols like MQTT for talking to their devices. Don’t get me wrong, MQTT is a great protocol that you can cram onto all sorts of devices, with all sorts of crappy PHYs, but I have wifi, and working SSL. I want to do something more web 2.0. Something like websockets. In fact, I want to take another service’s REST API and websockets, and deliver that information to my device… I could build a HTTP server + MQTT broker, but that sounds like a pain. Maybe I can just build a web server with socket.io and connect to that directly from the device?! 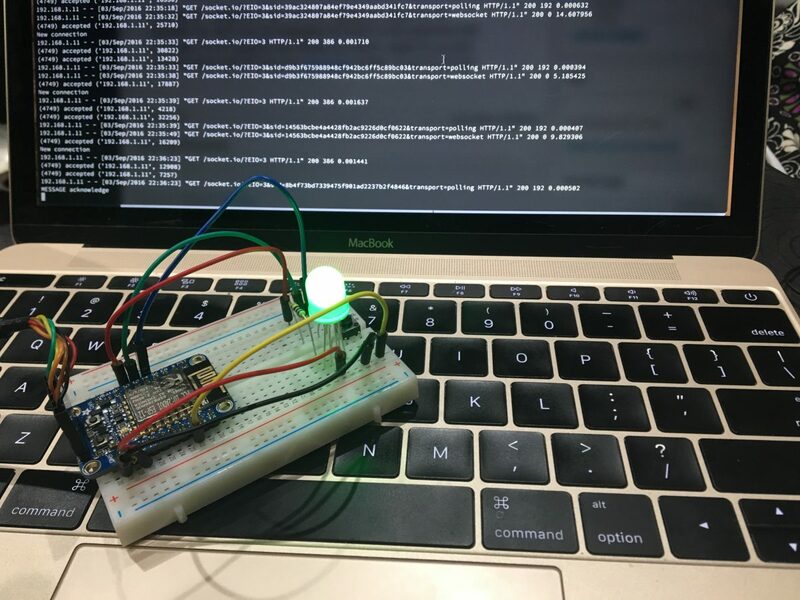 The ESP8266 already has some very basic websocket support for its WebREPL, but that’s not very featureful and seems to only implement half of the spec. If we’re going to have Python on a device, maybe we can have something that looks like the great websockets module. Turns out we can! socket.io is a little harder, it requires a handshake which is not documented (I reversed it in the end), and decoding a HTTP payload, which is not very clearly documented (had to read the source). It’s not the most efficient protocol out there, but the chip is more than fast enough to deal with it. Also fun times, it turns out there’s no platform independent way to return from waiting for IO. Basically it turned out there were a lot of yaks to shave. Where it all comes into its own though is the ability to write what is pretty much everyday, beautiful Python however, it’s worth it over Arduino sketches or whatever else takes your fancy. This works great until your migration won’t apply cleanly without intervention, your newly deploying pods are in crashloop backup, and you need to understand why. This is where the `oc debug` command comes in. Using `oc debug` we can ask for a shell on a pod running or newly created. will give us a shell in a running pod for the latest stable deployment (i.e. your currently running instances, not the ones that are crashing). However let’s say deployment #44 is the one crashing. We can debug a pod from the replication controller for deployment #44.
will give us a shell in a new pod for that deployment, with our new code, and allows us to manually massage our broken migration in (e.g. by faking the data migration that was retroactively added for production).